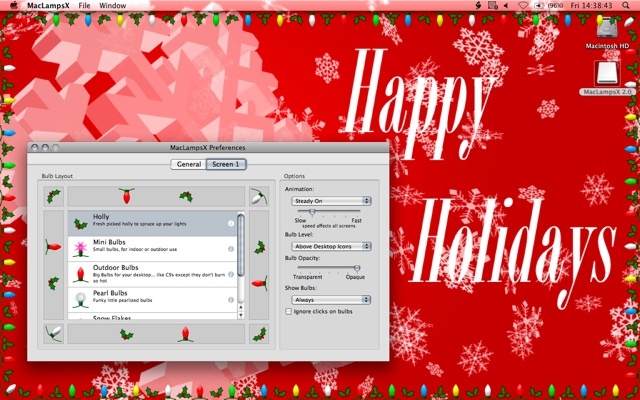 MacLampsX decorates your desktop with (optionally) flashing holiday lights. It was strongly inspired by a program for classic Mac OS, Holiday Lights. Hopefully it gives a touch of holiday cheer. Decorating for the holiday is always a fun thing to do! Version 2.0 has the ability to draw snow on top of your screensaver (basic screensaver provided to go with this), support for multiple displays, a somewhat-buggy music player, and new bulb options to allow different sizes and animation patterns. The bulb format MacLampsX is open, and in theory you can make your own bulb files. Over the years, I've had a few people take me up on that, and I'm pleased to make those contributions available here. Feel free to design your own to add! Candles that waver in the flame. 6 colors, with special candle holders for candles along the sides and top of the screen. Little flashing stars, extra pointy! Little Smilie faces to light up your day.